A new more flexible and secure login system deployed tonight. However, this will require all customers to reset their passwords the next time you log into contacthero. You will also now be able to login using your Facebook or Twitter credentials if you wish. Sorry for any inconvenience. 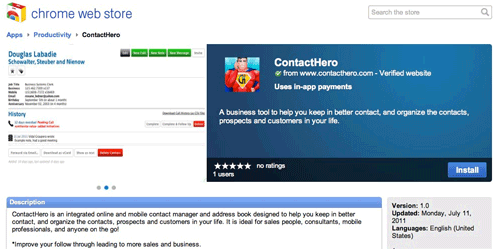 ContactHero is now available at the Google Chrome Web Store. ContactHero lets you share contacts between accounts. Previously, all contacts where kept separate between accounts. This feature is enabled for all accounts including 30 day demo accounts. Now you can keep a common address book across members of your organization. To turn on shared contacts, go to My Account and click "Turn on shared contacts". Contacts between different accounts in ContactHero are shared by creating a group (aka "domain") and inviting users to a group. Set a name for your group, e.g. “My Company”, and start inviting other users by email address. If they do not already have an account, they will be sent an email to create one and once they do will automatically be set up to share contacts with your group. As the group owner, you can add or remove users at anytime, and there is no limit to the # of users you can have in a group. You can also make other users group owners which will allow them to invite other users. Only group owners can invite or remove other users from a group. All users in a group can search, edit, update and delete shared contacts. They can also schedule calls, add notes, and view the complete contact history for any shared contact. Once you turn on shared contacts or join an existing group, you will see in your account the # of separate contacts you have, as well as the # of shared contacts in your group. Your contact list and list of calls will correspond to any separate contacts you have plus any shared contacts. You can convert all your existing contacts to shared contacts by clicking "Convert All to Shared Contacts" next to your number of separate contacts. You can also choose to have all new contacts shared by setting “New contacts are shared by default”. This option is set to on when you enable shared contacts. Turn it off, if you want to keep some contacts separate. If you are running the ContactHero iPhone app, you do not need to do anything special. Once enabled in your account, shared contacts will appear on your iPhone device just like any other contacts. ContactHero is now available to install and purchase through the Google Apps Enterprise Marketplace. ContactHero is directly installable by admins into any Google Apps domain. Using Google’s single sign on all users in the domain can immediately begin using ContactHero without any additional sign up or passwords. 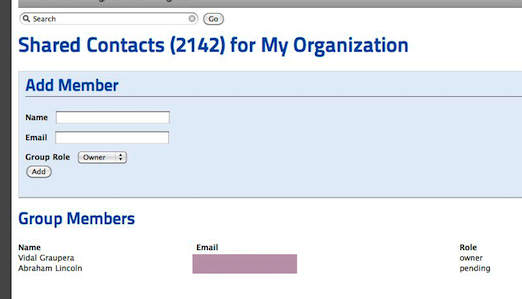 ContactHero will appear in the apps menu and is just one click away when using Gmail, Google Calendar, etc. as seen below. Contact us for more details including enterprise pricing. 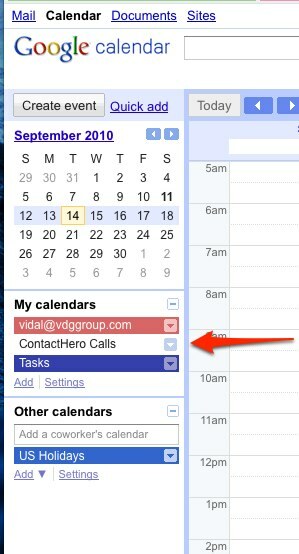 Did you ever wish you could see your Contact Hero calls and calendar all together in one place? Have you ever wanted to set reminders for your calls, invite people to a call, and to create calls in one click from events in your calendar? Now, you can with our new Google Calendar features. To start, go to My Account, and you will see a new section called “Linking to Your Google Account”. Click Enable and you will be prompted to log into your Google Account. If you have multiple Google accounts, Google will ask you which one. Choose the one where you keep your Google Calendar. Once you have given ContactHero permission to read and write your Google calendar, you can choose to have ContactHero automatically copy all new calls into your personal Google Calendar, or you can choose to add each one manually. Adding all new calls is off by default. Next you can select where you want the calls created. 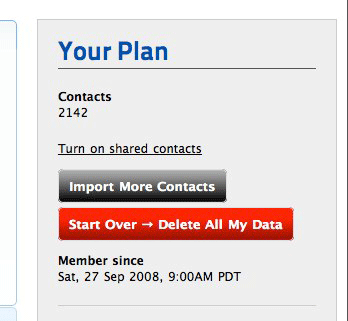 By default, ContactHero uses your default calendar, but you can choose a different one. This can be helpful if you want to filter out ContactHero calls. Click “Create a Calendar for ContactHero calls” and a new calendar will be created automatically for you in your Calendar account, and then ContactHero will then switch to use that calendar. You can delete this calendar later and switch ContactHero back to use an existing calendar if you want. When you go to your Calendar view in ContactHero you will see all the events from your default Google Calendar along with all the calls records in ContactHero. Events from your Google calendar are shaded in gray. If any of the Google events are linked to calls, when you click on them the corresponding call will open in ContactHero. If you click on an event that is not linked to a call, ContactHero will open a new call window with the information from the event. If you create the call this way, it will be automatically linked to the event from the beginning. If you reschedule calls in ContactHero that are linked to your Google calendar, ContactHero will adjust the times in your Google calendar. 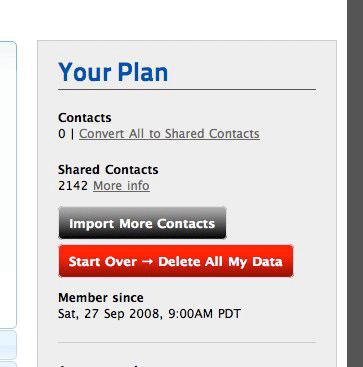 Similarly if you delete a call in ContactHero that is linked to your Google calendar, the event will be deleted. If you reschedule from within Google Calendar, ContactHero will not know the calls date and time has changed. 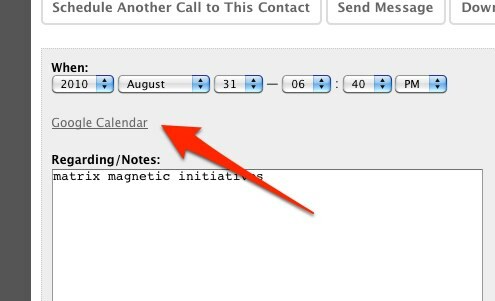 To update the internal time of the call in ContactHero, click on the call in the Calendar view. Please note however that when any call that is linked to Google Calendar is shown in the ContactHero calendar view, ContactHero will use the time from Google Calendar over the calls internal time. When you are editing a call in ContactHero, if the call is not already linked to Google Calendar there will be a linked titled "Add to personal Google Calendar" just below the date. Click this to copy to your Google Calendar. If the call is already lined, the link will say “Google Calendar.” Click it to edit your call in Google calendar and set a reminder, invite someone, etc. A native iPhone client for ContactHero.com is now available at the AppStore. This is the fastest and most direct way to manage your contacts and lists of calls on your iPhone device. You can upload individual contacts or your entire address book of contacts from the iPhone to your account at contacthero. You can also download contacts from contacthero and add them to your iPhone address book. We just pushed a major update to the user interface and design of the entire site both the web and iPhone versions. This new design is also more touch friendly so it can be used on devices like the iPad. The calendar has been totally redone and now has several new modes. All the videos and screen shots on the site will be updating in the coming weeks. You can now track updates, status and new features for Contact Hero at http://twitter.com/contacthero. Here is a 1and 1/2 minute video walk through of the dashboard. The dashboard is were you can see at a glance how you are doing in keeping in touch with your contacts. If your business depends on following up with leads and prospects you'll want to pay close attention to this screen cast. Contact Hero Dashboard from Vidal Graupera on Vimeo. Slides for an upcoming presentation on ContactHero developed by me and my friend John Waller. Summarizes some of the top features and benefits.